Who Wants A Big Bottom? When we get an e-mail with “Big Bottom” in the subject line, it’s guaranteed we’re going to pay attention. Even once we realized it wasn’t a romantic proposition, we remained intrigued. It was all part of a pitch from Big Bottom Market to feature their gourmet gift baskets in an upcoming story. Owned by Michael Volpatt, a gay man in Guerneville, California, one of the quaintest (and gayest) towns in Sonoma County, Big Bottom Market is one of the most popular places among locals and visitors alike. So we knew we were in for a treat and the gift basket they sent didn’t disappoint. Filled with Big Bottom Blend coffee, seascape strawberry INNA Jam, pistachio caramel corn and strawberry INNA Shrub for making delicious craft cocktails at home. 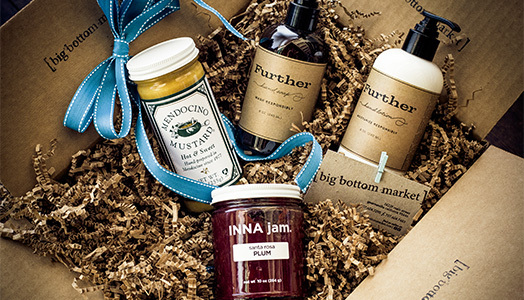 The $25 “Big” and $50 “Bigger” boxes are also loaded with artisanal home and food goodies. Or you can call and have them build completely custom baskets, too. We just love ordering gift baskets from a gay man because we know the selections will be carefully curated and top-notch. And who doesn’t love a top-notch big bottom?